When he was a child Kamran Panjavi dreamt of winning a weightlifting medal at the Olympics, but he never thought it would be for Great Britain. Born in Iran, Panjavi was caught up in the nation's passion for the sport, and soon followed his elder brother Kazem into training. 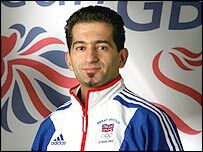 Ten years his senior, Kazem reached the Olympics in 1992, only to be disqualified for dropping the weight three times after injuring his shoulder. In 1995 Kazem emigrated to Britain - Kamran followed a couple of years later and now trains at his brother's gym in Hounslow, London. "If you win a weightlifting medal at the Olympics for Iran you instantly become a national hero," Kamran told BBC Sport. "Since winning that medal in Sydney, Rezazedah's life has been changed dramatically." Preparation for Athens has not been ideal - Panjavi spent 10 months out of training last year with a back injury that has still not completely healed. He returned last November to set a new British record of 250kg total at the World Senior Championship in Vancouver, and improved on that again at the European Championships. An eighth-placed finish in that event suggests a medal will be beyond him in Athens but whatever the outcome, Panjavi will just be delighted to be there. "I desperately needed this chance to go to Athens, it's the best thing that could happen to me," he said. "When I walk out with the British team at the opening ceremony it will be the happiest day of my life."